Caution: The following review contains spoilers. I think. There are secrets I cannot bear. There are silences within that can only be filled with unspoken words. And when my secret silences threaten to push me apart, when I am stretched tight and sloughing off the skin of outside voices, growing larger than I can keep contained, I open a book and open myself, burrow into the spaces between words and find comfort in compression into the lives of those who reside only on the thin edge of the page. I steal their life, their words, their insides; I can fit myself into them and am fulfilled in the reduction. I become the air they breathe, the regret that rises in their throat, the weariness that stings their bones, their surfeiting of hope and surfacing of joy. Transported, transformed, the best of books lets me live in them awhile, lets me leave a part of myself behind and marks me when I emerge again, somehow more whole without so much of me to hold onto anymore. 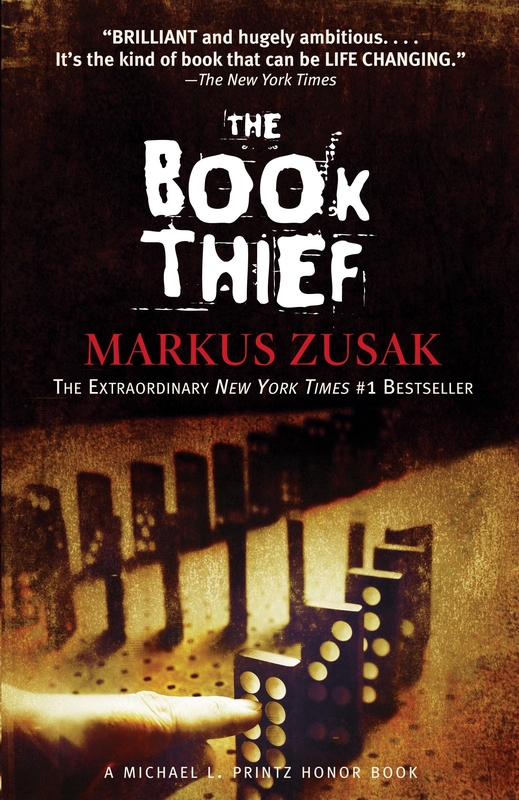 The Book Thief, by Markus Zusak, has taken a part of me, never to return it, and I am made better by the loss. A story of such ferocity, of such fear of passings and pains, stricken paths of lives half-lived and nearly-formed and barely-understood, and yes, a kind of uneasy truce with life and with ends that seem almost too much to be borne. From the start I am Liesel Meminger, her iced breath, her chilled fingers and numbed head as she steals her first book;The Gravedigger’s Handbook. It is an accident, a darkly glorious happenstance that writes the rest of her story in a moment. Liesel can’t read, Liesel doesn’t care; it’s the thing itself, the life contained within the covers, which makes the truth of her brother folded into the ground, beneath the snow, always cold and covered and small beneath her, lay not so hard upon her heart. Motherless and lost within herself, she turns to this slightly macabre book and her sternly soft foster parents, Rosa and Hans Hubermann, for a way back to warmth and life. She learns to read, and she learns to love, and in them both she finds strength and solace, a place to set herself and see beyond the specter of her brother who always appears, who refuses to fade. Liesel also soon finds a thieving accomplice in Rudy Steiner, who is always looking for a good scheme, a stolen kiss and a way to run beyond his future. But just as Liesel is beginning to settle into herself and warm to the world, prisoners begin marching and bombs begin dropping. This is Germany and this is the war, where kindness is rewarded with cruelty and where no secret is safe, even when it’s hidden in the Hubermann’s too-shallow basement of hope. Narrated by Death, spoken in words of wonder and worry and a perverse desire not to care too much because he knows how the story always, always ends, he is grudgingly taken by this girl he glimpses in the grim visits that bring him closer to her. He tracks her through the years, keeps her near to him, nearer than the others, perhaps, because surrounded by all of it, the fear and the dying and the hate, stubbornly she reads, she lives, and takes books like he takes lives; as gently as possible, bearing them up to a nobler state, holding them close and seeing in them what no one else will, giving them their purpose at last. As well as being Death’s diary of sorts, Zusak also manages to make The Book Thief a handbook of how to tell a story with both passion and tenderness, a story that pulls you along by the gut while floating itself into your soul. When he breaks your heart it seems a necessary thing; you don’t begrudge it, you welcome it, as he makes sure to do so with a final kindness and a last breath of joy. Zusak has left his own heart behind here, cracking it open with gentle fingers and letting it pour down the page, so that it is not just ink that stains our fingers. He gives us one last gift; he lets us see our own face always appearing, refusing to fade in the spaces between the words. Special thanks must be given to Nathan Dunbar, bookseller, word-shaker and recommender of this book. Without him, and others like him, the word-addicts and truth-delvers, this world would be a much smaller place.